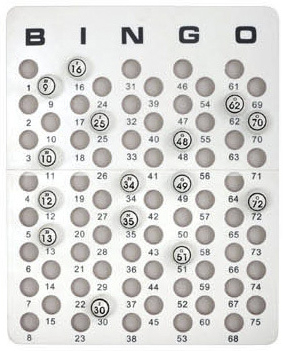 This is our Bingo Ping Pong Masterboard intended for ping pong size bingo balls. This is an easy snap together two piece plastic construction. After the bingo ball number is called, just set the ping-pong sized ball in its designated space to ensure game accuracy. This card holds standard numbered set of 75 ping pong size balls. Measure 20.5 inches by 16.5 inches.